THE FOAM ROLLER MUSCLE MASSAGE STICK TURNS YOUR SORE MUSCLES INTO HAPPY MUSCLES! THE INDUSTRY LEADER. 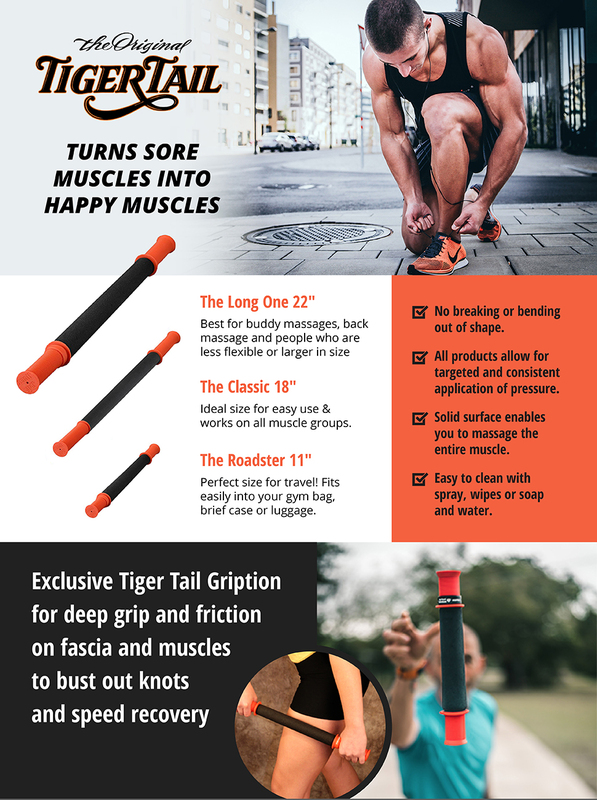 Tiger Tail was the first to successfully create and market the hand-held foam roller, and the massage tool we created is now a part of nearly every top-level training room across the country! RELIEVE MUSCLE SORENESS AND FATIGUE. Turn your sore muscles into happy muscles, while reducing stress and tension! Clinical research shows that up to 85% of muscle pain comes from tiny muscle knots. Tiger Tail is designed to give you a deep massage which reaches to the knots, breaks them up, and reduces your pain. PREVENT INJURIES. You can use your Tiger Tail before any workout to relax and loosen your muscles, which will increase mobility and reduce the chances of injury. After training, Tiger Tail will keep your muscles and fascia healthy and happy by breaking down small adhesions and promoting healing via increased blood flow. DON’T SETTLE FOR IMITATIONS. Other products are made of lower-quality, less effective materials (such as hard plastic) that can pinch your skin and leave you feeling bruised and injured. Our cushion foam roller is made from a high-quality, non-absorbent, non-deteriorating closed cell foam and is MADE IN THE USA! It’s a smooth solid surface that spins and moves easily. There’s a reason Tiger Tail is the leader in massage stick foam rollers – we’ve gotten it just right! The Fit Simply high-end exercise bands are the ultimate resistance band for booty and bodybuilding workout and much more. This resistance band set can be integrated seamlessly with every popular workout program including Yoga, Pilates and more. Or use them for general exercise, stretching, strength training, power weight programs, warming up Glutes and Legs, Activating Hips, Walking Side Steps, Hip Abductions, Squat & Deadlift Stabilisation, Hip Thrusts, Forward & Backward Walks, Side Lying Clams, Kick Backs and so much more.